Ten years ago this month, activist lawyer Stanislav Markelov was murdered in Moscow. We publish his reflections on Russian society’s nostalgia for the Soviet period here for the first time in English. Anatoly Savin / Wikimedia Commons. Some rights reserved. The following 2008 text (“Never-ending stagnation, or the almost-nostalgia for Soviet shops”) was one of a series that Stanislav Markelov wrote during the very productive period before his death, where he sought to analyse both current events and wider historical issues. Markelov’s wrapping of contemporary considerations into wider historical contexts are aspects of a number of his most fruitful articles. Here he reflects on Russian society’s nostalgia for the Soviet 1970s, the so-called “stagnation” era. Although the comparison of the Brezhnev and the Putin eras has since become something of a cliche in the 2010s, Markelov brings a new perspective, focusing on everyday material realities. Indeed, for Markelov, “socialist realism” and “capitalist realism” become dreams of calm and oblivion wedded to a iniquitous and constraining system with deep roots. Of course, you remember Druzhba [Friendship] processed cheese for 20 kopecks? Or rather you will if you’re over 30. There’s an interesting psychological experiment which I have often conducted on acquaintances of mine. With people slightly older than me, we have the same memories, the same set of joys, deficit goods, common interests and even same places to hang out. As soon as I find someone two or three years younger than me, then a time gap emerges. The children of perestroika recall things in a completely different way, as if they had lived in a completely different state. Today, as you pick over your rosy dreams about Rubin television sets, Finnish smoked salami and Viola processed cheese, you suddenly find out that nostalgia does not correspond to what life was like back then. Memories of one’s youth not only amongst the average citizen, but also scholars and politicians have long departed from reality. As if [the 1970s] were not a period of stagnation, but a lollipop, just like those ones, their watercolours shining, which Gypsies sold at the market. But in fact, Soviet society during the stagnation era was far from uniform. Like the Soviet shops of those times, it consisted of three different and irreconcilable parts, with people living in completely different worlds which almost never overlapped. So, let us start our excursion of memories into the shops of our childhood. First of all, we encountered the shop window. Unlike today’s shops, the shop window of the stagnation era always had more goods in it than the shop itself. The external picture should advertise not the goods themselves, but a way of life. This means it should be more attractive than life itself. In our country, slogans replaced the adverts, much like capitalist countries, and with the same aim of brainwashing. Presentations of goods for foreign tourists were like the wrappers of western goods, where behind a beautiful and bright label there was just some tasteless synthetic material. Hungary may have had its “goulash socialism”, but Hungarian goulash, along with chicken and lecsó, were deficit goods in Soviet Russia. The Soviet bloc needed a window display for the West and Hungary, the GDR and partly Czechoslovakia played the role of shop windows for the Soviet good life. Moscow was the window display for the Soviet Union. Each individual lucky enough to travel to the capital from other regions was obliged to bring a sack of presents for all their relatives, just as when they were on Soviet business trips abroad. 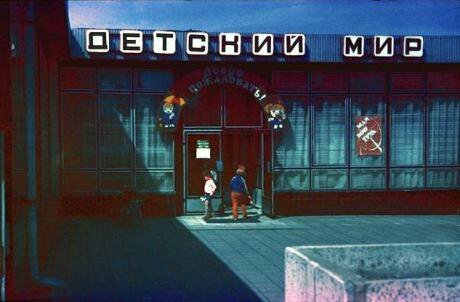 Each capital of the Soviet republics would also act as window displays. But even the shop window would differ from that of a normal shop. If, by definition, sample goods were supposed to be on on public view, then the Soviet bloc also gave rise to closed shops, where the elite could go shopping behind a window impenetrable from prying eyes. Special rations, special dachas, special cars and special vacations in special resorts – these were obligatory aspects of the way of life of the Soviet elite living behind their darkened windows. They were few, and unlike today’s oligarchs, they did not put their privileges on display. The nomenklatura of the stagnation period was a reserve for the rich and powerful, a separate caste, which you couldn’t get into even if you stolen a lot of money. After the shop window, the main shop awaits us, with that same Druzhba processed cheese, the bottle of freshly diluted kefir and, if one is lucky, Soviet spam. The majority of people had their joys, but these joys were always small, domestic and the same throughout the country. The hockey team were victorious; one managed to obtain a deficit good; finally, after five years of waiting, you could move from an anthill-like communal apartment to a separate cell in a panel block. Remembering those years, people say, barely concealing their joy: there was a certainty that a family would receive an apartment in three years’ time, all the while forgetting that another family was completely certain that there was no hope for them for the next decade. Of course, memory filters out the worst: the endless queues, chasing deficit goods and squabbles in the communal kitchen are forgotten because they are not worth remembering. All that’s left is to look at old photographs where everyone is dressed in the same grey clothes, as if they’ve just come out of an incubator, where they have the same hairstyles and barely differ from a soldier who stands to attention and goes to bed at the instruction of the television at the end of the evening. The most interesting part, of course, was not in the general [shop] hall. Everyone who was just a little bit different, and weren’t members of the official nomenklatura, was served under the counter. It is interesting that the present generation doesn’t really understand the meaning of this word and can’t even imagine the straightforward meaning of what to “put something under the counter” means. It was precisely in these storerooms where those special interest clubs formed, where real life was bubbling away. You could get in there in any number of ways – through connections, money, an overactive mind, a curiosity that verged on insistence. Given that there were many locations, albeit small, the groups were divided into small atomised communities which sometimes even did not know of the existence of each other. When someone went too far or became too public, then this provoked repression and the common discontent of the majority, who with no access to these places. This cliquishness in the back rooms of Soviet society is different from an underground. People were not punished for their presence there alone. But the very possibility of access was clear evidence that you are other, at least someone not completely Soviet and that you can be proud of at least some measure of your own independence. Indeed, it was here that deficit goods reigned, in the form of goods from the west, or the no less forbidden ideological delights – samizdat, tamizdat, spetsizdat and reprints from a typewriter, in a barely legible sixth carbon-copy. Life in these back rooms offered that very romanticism completely absent from official Soviet life. Even today one can become nostalgic watching Brezhnev with his lisp, but I have never met anyone crazy enough to call the congress of senile old men of the CPSU romantic. Apart from the classic middle-aged memories of one’s youth, the most interesting thing here is that those who experience the most nostalgia today were, in fact, members of the majority, the people who enjoyed their Druzhba processed cheese and their holiday shopping orders, with a block of undrinkable third-rate Georgian tea to go with, of course, a tin of red caviar. Clearly, what’s at stake here is not just stability and the absence of radical changes. The archetype of stagnation goes much deeper. This is Ivan Olbomov’s dream of a nightly bowl of borsch, his greatest joy, it is [Saltykov-Shchedrin’s] Old Years in Poshekhonye, which became old well before their time, it is [Gogol’s] Old World landowners rejoicing over a screeching door which they never contemplate oiling. If [folk hero] Ilya Muromets lay on a stove for 30 years [until being cured by pilgrims], then this 30 years of lying down fully fits the image of the Russian bogatyr. If the [folk hero] Emelya awaited a miracle, laying on the same stove, then why would one even want to get up? After all, a miracle somehow comes by itself and if it does not come then there will be some catastrophe like a nuclear war. At that point we will all get up, and it will not matter whether it is to die or gain a new victory. Indeed, a miracle is needed so that Emelya may “reign while laying on his stove”. Stagnation is endless, and in the shiny lights of today’s supermarkets I can once again see that some “three-part formula” splitting our society into non-contiguous sections. One part, like in the window display, mainly lives in the West, laundering their money, and sending their children to study in the best Western universities, so that they do not die of boredom here and return to the sinful motherland only to participate in further squabbling for a place in the trough of power. This is all done quietly, behind the scenes in order not to disturb “stability”, which has become the main criteria of all the activity of today’s authorities. The last eight years all that the state has done has been for the sake of self-reinforcement, stability and that which is elegantly named “strengthening the power vertical”, forgetting that over-strengthening deprives any structure of flexibility. But the oligarchic state’s display window has already been created. For us, it is just as inaccessible as the cortege of Chaika and Black Volga cars was for the common Soviet person. You can’t say that the current authorities do not think about the people. They are, leaving them those same everyday joys they had 30 years ago. The Sport television channel with those obligatory victories of ours, even if they have been purchased on corporate money, the Eurovision Song Contest and as a culminating pleasure a beach trip to Turkey or Egypt if there’s enough money. Yes and, of course, I forgot about Druzhba cheese, but insofar as our society has been modernised and no one remembers the term “stagnation” then we will replace Druzhba with Snickers, although, to my mind, that processed cheese was tastier and healthier than that repulsive sticky stuff thrust onto us by advertising. Everyone who is not satisfied with the kitschy pop music crawling to us from the telebox are scattering back into those same old back rooms. Again, this is no underground. No-one ousts them from the stuffy bug-infested dives – there they are trivial and pose no risk. The conditions themselves do not permit one to gather in large groups and unite with other similar gatherings. Those who climb too high, shout out too loud or attempt to unite everyone get bashed over the head, at times literally. The sole achievement so far is that the idea of “deficit” is no longer about goods and materials, but marginal circles’ interest in information. Now instead of jeans and retyped copies of Mikhail Bulgakov, people offer each other real information as the most valuable thing, which supports the embers of communication for like-minded people. Indeed, times change but the stagnation remains. The question remains: is this the most stable system for Russia? There’s room for reflection, especially given there is going to be a very long time for discussion. The important thing is not to shout your conclusions too loudly, not to crawl out of your bug-infested back rooms – after all, it’s a good place to hunker down during our new endless era of stagnation.